Some of the horses we have trained while we lived here…. Most of the stuff is packed but not all. One thing I am looking forward to finding, reviewing and then packing are all of the old show photos. I know they are still in the other room waiting for me to carefully store them. Photos of my boys so tiny standing, or being held, in the photos with their parents and their mounts. Horses are woven into all of our photos…family…business…it all blends. I will post some when I find them. And now Jac had his start here. I am excited for the future but I’m starting to think that last day might be….rough. ← What age should I begin to train my foal? Any chance that you are taking any “Can Can” horses to Texas with you? Super! Your Titantic ride with Vaquero was so crisp and clean that it still gives me goose bumps! Not to take anything away from Roxy, but he was something too! Hope you add a third generation to the videos. All the best on your new adventure! Thank you Mary, I always thought Vaquero deserved his spotlight too but with Roxy…he was overshadowed. DID YOU SEE THOSE SPINS! Wow, he was so fun. The last day will full of emotions, nothing anyone says can change the way you will feel. But once you are on the road you will be looking forward to the new adventure that awaits you. One day you will find another home to call your own, and you can rebuild new memories. I have moved from country to country and all over one country and everytime we settled and enjoyed the new, Finally now my kids have kids of their own I am in my last house I hope. But I will never know maybe something better will come along. I always have been a bit of gypsy. To have itchy feet is good, humans are by nature nomadic creatures, follow your heart and your feelings and most of ENJOY THE RIDE. Yes, Jac is going with me. Greg is all for it. A home is just a house, until a family with memories makes it a home… Home can be anywhere, anything! I have learned that in my over 44+ years of marriage and moving… The last home we were at for 28 years. We raised our two kids, 2 dogs, a ferret and assorted other “critters”. We saw our family & children’s friends grow up there too!! Then our son married, and brought 3 grandchildren into our lives there. But it was time to downsize before retiring. I admit this house is home, but it is not HOME…. but I have my pictures, my kids, grandkids and most of all my memories… so for now, this is becoming HOME..
All the best to you and your family (& horses) in this new chapter of your life! This is purely selfish but I’ve had this dream for the last 10 years that somehow I would get up the nerve if I saw you in town again to go up and say hi I can’t tell you how sad I am that’s your leaving Mount Gilead there were a lot of sad faces at the horse and pony monthly 4H meeting last week you and your family will be truly missed i’m going to missed saying I just Live down the road from Stacy Westfall. You an amazing horsewoman . I truly believe that if it wasn’t for you. Weaver would’ve never noticed us when the sanctuary flooded . Cannot tell you how much the care package help. Anyway I wish you and your family all the best on your journey and pray that it is a safe one and even more than you were hoping for. Ohio will miss you Stacy! Farewell to the Westfalls from Ohio and hello future! Best wishes. Enjoy watching you ride and work with horses. May God bless you and your family in this part of your life journey. God will use your to continue to make a positive difference. Stacey, come on down to Tampa and enjoy some warm weather. I have a coming 2 yo, son of Joey, for you to meet, great barn and facility to visit! Best of luck on this new adventure…I wish I could drive with you! Best to you and your family, human and critter! I just can not stop watching your video over and over. I am really excited for you but at the same time really sad to see you go. I hope that you will return in April. GOOD LUCK!!!!!!!! God has a great Plan for You!!!! A NEW CHAPTER STACY..GOD BLESS AND ENJOY THE ADVENTURE.. It will be hard. But as you already know, anything that’s worth doing usually is hard. Trust in your instincts. God has more great things in store for you. 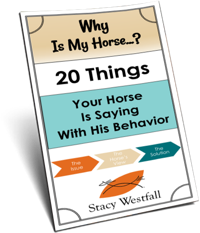 I watched each of these videos and the one thing that stands out, apart from how talented you and your horses are, is that your horses are HAPPY. It is so wonderful to see someone competing at the top level with animals that clearly enjoy their “job.” Keep up the good work, keep your heart open and keep updating us! We all love you! New Beginnings are always a challenge…even for the best of reasons…the memories you have are priceless…and the memories you make will be priceless, too… prepare to smile again…and find new ways that God has blessed you….but grab a box of Kleenex as you pull out of the driveway… Hugs and Prayers for you as you begin a new journey…and keep sharing your adventures. You have good friends and fans out in the electronic world. Bless your heart, I know it will be hard but the future is ahead!! We moved off the farm a year ago. I had lived there 30 years. My husband had lived there his entire life. It was hard, but it is fun making this new place ours. Safe travels to a new horizon. You can scan everything into a little external drive and take all the memories with you. I love watching your progress. Jac is really coming along. It must be a bit scary what you are doing, but what a great adventure for you all! God bless and keep you safe and happy in your travels. Would love to learn to ride like you do it amazes me. Stacy, it’s always hard to leave a place where you’ve made a home, and had much success. I’m sure the Lord has something absolutely wonderful in store for you and your family! You are such an inspiration to so many! Just keep everyone posted on all the news. Many prayers going up for y’all. what an inspiration you are to me! Thank you!! and the Very Best to You as you continue on your journey in this incredible life!! God Bless you always!!! you may be leaving your home forever, but you take all your memories with you always.! Hope to see you in Maine again this summer at Teresa’s! We missed you last year at Larry’s clinic! new home but old friends! U R an inspiration! Stacy you will be sad, but you will always have your memories. You, your husband and your kids will soon be off on a once and a lifetime adventure, making more memories, that will last all of you many lifetimes. I for one am excited to see, hear as much as you are able to share. You are an amazing women! me too! God Bless you and your family! Thank you for the passion! Leaving is always the hardest part of life on the road. No matter how many times you leave, it doesn’t get any easier, even when you’ve only been there for a few days. If it ever does get easy to leave, you should quit moving right away, because you’ll have to be jaded and hard hearted to leave without pain. Remember that the good times don’t live there, they live in your mind, and you’re taking that with you (hopefully!). Carry them with you, always. If the last day is rough, it’s simply because you CARE. You have invested your soul to many, many things there ( including the butter coloured wall). It’s nice that you CARE. Perhaps your care has outgrown just one place, for now. You will always have your old memories but sometimes we need to move on and make new ones, Good Luck in your new place! !